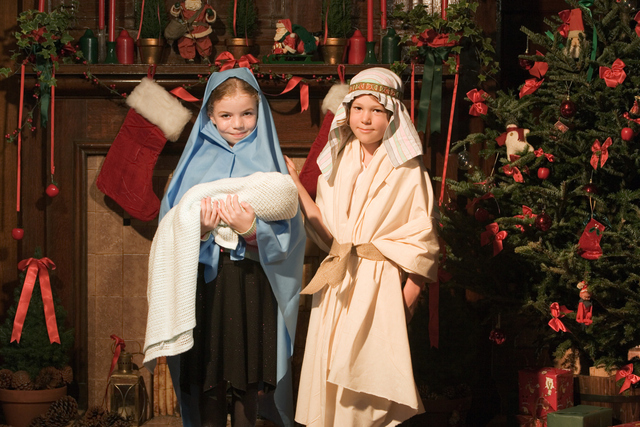 byEric D. Huntsman excerpted from "Good Tidings of Great Joy: An Advent Celebration of the Savior's Birth"
Most model nativities feature this classic display: Mary, Joseph, baby Jesus, the wise men, and the shepherds. Some may know the wise men were followers of Christ who presented Him with gifts of gold, frankincense, and myrrh to symbolize Jesus’s kingship, divinity, and His suffering and death. But what was the significance of the shepherds at the Nativity? Why were shepherds, of all the people, invited to see Christ following His birth? The answer might be more significant than you think. It is clearly significant that the announcement came first to shepherds. Though Matthew relates that the news is conveyed later to the wise men—no doubt representing the privileged and educated—via the means of astronomical phenomenon, the lowly shepherds in Luke were informed by direct revelation immediately after Jesus’ birth. There is a tendency to romanticize the shepherds, making them in our imagination good, gentle, humble figures. In actuality, shepherds at the time were often looked upon as unclean and outside the law, sometimes even as dishonest, because they often grazed their flocks on other people’s lands. In this case, they fit well with Luke’s emphasis elsewhere in his Gospel, where Jesus declares he has come not to the righteous but to the outcasts and sinners. Others have noted, however, that many of the flocks near Bethlehem, which is only six miles from Jerusalem, were intended for temple sacrifices, in which case one sees an entirely different symbolism. Jesus came as the Lamb of God, to die for the sins of the world, and it was perhaps to the keepers of temple flocks that his birth was first announced. A particular site, Migdal Eder, or “the Tower of the Flock,” is noted in connection with these sacred flocks. Mentioned in Genesis 35:21, it is also mentioned in Micah 4:8 as part of a larger oracle which includes the prophecy in Micah 5:2 that the Messiah will come from Bethlehem (see Chapter 4: King of Israel). Luke describes the angel who appeared to the shepherds as simply being “the angel of the Lord” (Luke 2:9). Matthew also uses this title when he describes Joseph’s first visionary dream (Matthew 1:20). In both cases there is an echo of a common divine messenger who represents the Lord so powerfully and directly that he, or his words, are often interchanged with God himself. The sense then is that the message the angel delivers is directly from God, which is reinforced by Luke’s description that “the glory of the Lord shone round about them.” As in the Old Testament, glory is a visible manifestation of God’s power and radiance, sometimes even representing his presence. In view of this, the shepherds are understandably afraid, which proves to be the first step in the commissioning or annunciation pattern we have already seen with Zacharias and Mary (see Chapter 2: Promised Savior). In the second step of this pattern, the messenger tells the frightened recipient—in this case recipients—not to be afraid. The announcement that follows is one of the most well-known passages in the Christmas story, one that summarizes the joy and gladness of this sacred event: “Fear not: for, behold, I bring you good tidings of great joy, which shall be to all people” (Luke 2:10). The single Greek verb euangelizomai yields the entire phrase “I bring you good tidings,” and it shares the same stem as euangellion, meaning “good news” or “the gospel.” While the birth of the True King was certainly good news, the good tidings that would bring joy to all people is ultimately found in what Jesus would later do—suffer, die, and rise again—making the good news that of salvation. In line with this, the angel of the Lord continues, “For unto you is born this day . . . a Saviour, which is Christ the Lord” (Luke 2:11). While the idea that God is a savior who rescues his people is certainly present in Hebrew prophecy, the Greek word for “savior” (sōtēr) had particular political implications in the context of a Roman-governed state, suggesting the political or temporal benefits that a worldly ruler provided his subjects. This is the same context in which Luke places the Nativity by beginning it with a reference to Augustus. For Luke, however, the source of salvation, peace, and prosperity is not the Roman emperor but the Anointed One promised by God. Then, by equating this Christ with “the Lord,” Luke further identifies the baby as the divine Jehovah, since the Greek kyrios and Hebrew adonai (“lord”) were both substitutes for the divine name YHWH. Despite the majestic identity of the baby, the angel gives the shepherds what seems like an incongruous sign: “And this shall be a sign unto you; Ye shall find the babe wrapped in swaddling clothes, lying in a manger” (Luke 2:12). The swaddling in itself was not likely to be the sign that the shepherds would recognize, because swaddling was a sign of parental concern and care for a newborn. Rather, finding a newborn child in a feeding trough would be the sign unusual enough that the shepherds would know they had found the correct baby. Yet before the shepherds can hurry to Bethlehem to find a child swaddled in a manger, the angel who had been speaking to them is joined by an angelic choir praising God—much as they had when they “shouted for joy” at the creation (Job 38:7). Their song constitutes the briefest—but no doubt best-known (perhaps because it is the briefest)—of the four canticles in Luke’s Infancy Narrative. Known as the Gloria in Excelsis from its traditional title in Latin, it has entered the liturgy of several churches as well as the music of countless songs. While textual evidence suggests several possible renderings of the song (see “Peace on Earth—to Whom?” page 83), the version well-known from the King James Version of the Bible is: “Glory to God in the highest, and on earth peace, good will toward men” (Luke 2:14). The lack of a verb in each phrase of the song suggests a Semitic original that Luke or his source translated into Greek. In addition to being a simple declaration, it is possible that the missing verb “to be” is intended to be imperative or jussive (commanding) in force, meaning that it is a prayer that glory be to God and peace be on earth. The expression “in the highest” in English can be taken to be an expression of degree, suggesting that the angels were giving God the highest praise, but in Greek the prepositional phrase en hypsistois is more likely to be locational, describing where the glory should be found. Hypsistois can be either masculine or neuter plural, so there is the possibility that the glory is to be found “among the highest ones,” perhaps meaning among angels or other divine beings, though the most likely meaning is that the glory should be in the highest places, meaning in the heavens. This finds an important echo later in Luke’s account of Christ’s Triumphal Entry, when those who welcome Jesus as he approaches Jerusalem prior to his Passion cry out, “Blessed be the King that cometh in the name of the Lord: peace in heaven, and glory in the highest” (Luke 19:38; emphasis added). Thus the hosts of heaven at Jesus’ birth and the multitude on earth before his Passion form antiphonal choruses bracketing Christ’s mission, the angels praying for peace on earth and the crowds praying for peace in heaven. Yet both groups ascribe all glory to God in the highest heavens, even as the premortal Christ himself pledged all glory from his mission to God his Father (Moses 4:2). The result of Jesus’ saving mission would be peace on the earth—peace in individual hearts, within families and friendships, and between groups and nations. But ultimately the mission of this precious baby would be to reestablish peace between God and his children, reconciling us through the atoning death of his Only Begotten Son and bringing us true joy (see Romans 5:8–11). Author Eric D. Huntsman, in Good Tidings of Great Joy, has provided yet another insightful look into the origin, meaning, and celebration of an aspect of the Savior's life. Beautiful illustrations, fine artwork, and photographs accompany the latest scholarship about the birth of Jesus Christ. Sidebar articles illuminate various aspects of our Christmas celebration, from the music that delights us to the symbols that have accumulated through the centuries to become familiar and welcome reminders of the season.